Small fix for missing Stat text and Ability text. Fix CTD when editing stats for Crusade, missing schema file. Fixes 'cannot find file' when loading. After recent update some core files names have changed. Fixed race preclusions not filtering correctly. Fixed race trait prerequ's not filtering on race type. Fixed stat editor now selects correct XSD file. Fixed missing specialization techs. Thanks to Wider93 for spotting. Fixed precursor components appearing on multiple techs. Fixed race ability overlay not drawn after undo. Fixed duplicate mining resources on mods. Added Crusade unique stats to mouse over. Added missing abilities, Discreet, Experienced, Scavengers. Added add new ability and preclusion to edit tech. Added preclusion list to tech mouse over. Should now display mods correctly. (Tested on Horemvores GST mod). Small update available. Just bug fixes. 0.1.6.7. N.B. This is the main executable only. You will need version 0.1.6.6 installed first. Fixed CTD with missing text on mouse over. Fixed Text description edit Undo not updating main window. Added extra error trapping, debug logging. Hot fix 0.1.6.6 Available on nexus. Fixes - pasting duplicate tech not saving correctly. Includes new app icon courtesy of Horemvore. Fixed: CTD when removing specialization if Draw Tech icons selected. Fixed Bug pasting tech to higher tech age. Fixed Paste tech not renaming all tech nodes. Added workaround for misspelt 'GaurdianFighters' Stat. Added Scroll with arrow keys. Added Drag and drop support for moving Techs around. Added can view core files in editor (double click) with warning. Improved XMl parsing. Takes longer on first load, all static XML files are parsed and cached. Selecting Tech Trees with stat icons enabled is now much faster, 10X faster on my PC. You can now add or remove stats. Select from drop down menus. Video from version 0.1.6.2 N.B version 0.1.6.5 released with additional Stat editor features.. File watcher not updating after changing mod location. Special techs sometimes drawing in wrong colour. Copy, Paste. Can copy and paste across different trees. Remove specialization techs. By group, category or all. Separate save states for modded, core trees. Hot Fix for 0.1.2.9 Fixes category button lock-out bug after editing. Move Tech not adding all prerequ\options when moving to a specialization tech. Double click stat icon not going to correct xml line if similar named stat exists. Category buttons have correct names. Mod support for other languages. Doesn't presume English\Text folder. Tool still in English. Edit Mode to prevent unwanted edits if using as a viewer only. Drag and Drop support for moving Techs around, still needs work. Prompt to reload file if it has been externally modified by text editor. Prompt to copy xml file to mod folder when attempting to edit a core file. Rewrote logic for checking editing of core files. Some minor UI Gfx tweaks. ***Not all stats are in the same order as in game. Hovering over hull stats will display all the stats not just 2 as in game. New images over at nexus. As a Tech Tree Viewer, I think it is pretty much feature complete. The Editing side still needs work, I plan to update the Stat Editor next release. Reverted edit windows to be non UI blocking. On first time use points to example mod, creates it if it doesn't exist. Checks to prevent certain functions while editing. Specialization expander techs stay open after updating via edit. Multi undo to text edit. To be consistent with other undo's. Auto generated Generic name when adding new tech. Can be manually changed. Checks for duplicate Generic name. Tech selection mode. Toggle tech either coloured or grey. (in game researched not researched). Shift Click tech to select, only useful on Specialization expander techs. Save (ctrl S) saves tech selection state as well as any edits to tree. Repeating 'cannot find file' on load. Add new tech creating unnecessary nodes. Move tech not updating all 'prerequ\option\' nodes. Brief instructions for new features. Left click a tech to select it. Selected tech will flash. Add new tech - creates a new tech based on the selected tech, you will be prompted for a new generic name for the tech or use the auto generated name. Checks are made to ensure the name is unique. Adds an entry to the relevant TechDefsText.xml file. Delete Tech - Deletes the currently selected tech. All connected techs will be re-connected to the proceeding tech. Grouped Specialization techs will all be deleted unless you individually select them. Undo- Each time you add, delete or move a tech, it will be added to the undo list. The number of undo's will be shown in brackets. Short cut keys - Del key = Delete, CTRL - S = Save, CTRL -Z = Undo. F5 - reload tree from file. CTRL - W = Edit stats, CTRL - E = Edit description, CTRL M = Move tech, CTRL T or CTRL Click = Toggle tech state. Features in progress, not released. Add stats to existing tech. Select improvement, module etc from list and drag to tech tree to link it to a tech. List improvement, modules etc. to see chained techs and highlight any orphaned techs. Latest images taken from Horemvores excellent GST mod. Updated mouse over, custom tool tip similar to in game with stat icons. Yes, this! Where is this so I can plan my strategies based upon tech tree used etc etc? I have a very basic Tech tree viewer almost ready for testing. One small bug to fix after work. It's not pretty, there are no lines connecting the techs, they are colourless, the tech descriptions are the generic names and you can't edit them. ATM. It's taken longer than I thought just to get the techs to display similar to the in game techs trees. Some techs are listed higher or lower, but in the correct order, than the real trees. There were inconsistencies in some trees that I had to over come. i.e. Altarian and Thalan trees have techs with missing AgeOfWar Options. I am open to suggestions as to which direction to proceed. edit functionality (open to suggestions). If there is sufficient interest I will continue to develop it further. You will need .net 4.5.2 installed to run it. Any one interested in testing it? Link removed, added to OP. Added connecting lines and colour. Tech descriptions are still their generic names. Some tech trees don't display all the techs in the correct position. Some techs may appear behind other techs. I am working on fix. Once I get the logic sorted for the trees, I will add more functionality. Let know if you have issues, suggestions. Make sure that you know what techs are connected to what. Maybe listing them after the tech. Displaying the tech xml as a tree is quite easy. Displaying it like the in game tree is proving difficult. I don't know SD's algorithm. I can only guess by observation. There are a lot of inconsistencies in the trees which I have had to over come. Just when I think I have cracked it, some alien tree won't play ball. I have new logic which seems much better. I will release after testing. Updated OP with link to latest version. Link removed new update pending. I am struggling with some information. Each tech has a generic name which is referenced in other xml's, to link stats with techs amongst other things. I can find all of the other stats Hyperdrive, life support etc, but I can't find this one. I cannot find a reference in the xml's for Moves, I must be missing something. Damn. Easy when you know where to look. I thought it was in a separate file. I wonder if there are any other stats like this I may have overlooked. Editing is not ready yet with this tool, still in alpha. BuckGodot already has a mod to change tech specializations to normal techs is that's what you are trying to do. I hope to have basic editing available soon. See OP for link and changelog. Planned to release this earlier but had a minor setback. Had to re-write the tree logic after trying BuckGodot's generalized tree mod with the tool. It didn't display correctly, overlapping techs everywhere. On the positive side, now the tree logic is done in 2 passes instead of 6. Its as close to the in-game trees as I think I can get. I could do with some input as to how you would like the editing to work. Edit - opens up an edit window, where you can directly edit values and text descriptions. Add new - adds a blank tech connected to this tech. Change connection - left click the tech you want as its prerequisite. Just uploaded the latest version to nexus mods. Lots of bug fixing, code clean up. Fixed Custom tech trees not showing in list. Added clone tree for editing. Added right click edit menu - not fully implemented. Added partial editing - more soon. 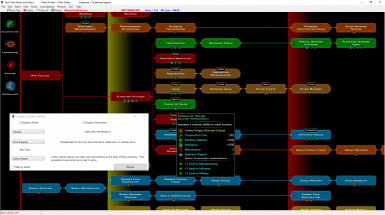 I get CTD when trying to examing custom tech trees from my Star Trek mod. Its fine till I get to the FED tree, that cause it to crash, it will then crash there after on any tree if I boot it back up again. Which version are you running. 0.0.9.9 should catch this error. Check the log files. Edit: look for WARN in the logs. It assumes file naming conventions, ST_FED_TechDefs.xml it is looking for ST_FED_TechDefsText.xml, but is named ST_FEDTechDefsText.xml in your mod. This relates to me not fully understanding the modding rules, i.e. append method. I am currently re-working the xml parser to include files that have different names but same structure. Its not 0.0.9.9, version before, I will update it. Create new tech tree - copies and renames internal names ready for customising. Creates Text and Specialization xmls also. Edit tech - mostly working. Not all elements are data bound for easy selection yet. Open text editor and jump to tech - requires notepad++. Sorry, not had chance for a while. Job got me working all hours. Will be back on it soon TM. Now THIS looks incredible, and it's something I've been wanting for my custom faction.